Residents of Pittsburgh’s Squirrel Hill neighborhood are still reeling after gunman Robert Gregory Bowers entered the Tree of Life Synagogue and shot 11 worshippers dead, while allegedly shouting anti-Semitic slogans. Bowers is currently being held without bail. Charged with murder, assault and hate crimes, the 46-year-old faces 535 years in prison or the death penalty. Now, Pittsburgh police are investigating “anti-Semitic pamphlets” dropped in the neighborhood by a group calling itself the Loyal White Knights of the Ku Klux Klan. Curiously, the pamphlets were dropped in plastic bags – presumably to keep the racist screeds inside safe from the Pennsylvania winter – and accompanied by handfuls of what looked like birdseed. Similar birdseed-and-leaflet bags were dropped by the Klan in Virginia, Washington DC and New York earlier this summer. Rather than attempting to lead some kind of whites-only ornithological revival, groups like the White Knights use birdseed or small pebbles to weigh down the plastic bags, allowing them to be chucked out the window of a vehicle at night, into parks, driveways and gardens. 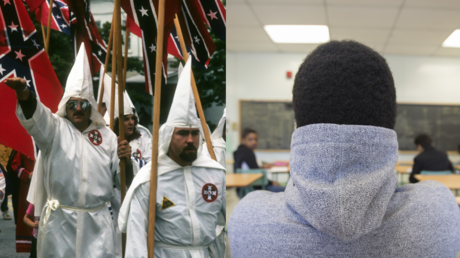 In this case, the flyers attacked the “Jewish media” for failing to portray the Klan accurately in Spike Lee’s ‘Blackkklansman’ movie, ripping “Jewish Hollywood” for not treating the KKK’s rituals and secrecy with enough respect. The rambling letter claims the KKK is being victimized for its success in fighting back against “the problems the Jews are engineering in our society,” and ends with an appeal for new members to join the fight. Jews are not the only ethnic group targeted. The flyer describes the group as “whites only” and states that “No Blacks, No Jews, No Mexicans or fags, No Asians or Satanic Catholics” are allowed to join the White Knights. Other pictures submitted by locals on Reddit show flyers with different messages. One complained about Hispanic immigration, one pointed out racial disparities in crime statistics, and another simply reproduced a speech from a former Imperial Wizard of the KKK. “This is a prime example of how hateful people don’t only hate one group of people,” Jewish Federation of Greater Pittsburgh CEO Jeff Finkelstein told the Daily Mail. Only one week previously, Finkelstein had attended the public lighting of a Menorah to honor the dead worshippers. Police investigating the flyers said that “such hate-filled material” will not be tolerated, and insisted that the city’s Jewish community will recover from its loss and “remain stronger than hate.” Meanwhile, the Anti-Defamation League (ADL) reckons that anti-Semitic incidents rose 57 percent in 2017, and the FBI reported a year beforehand that Jews are the victims of 54 percent of all reported anti-religious hate crimes, despite making up under 2 percent of the population. However, while various KKK-associated groups occasionally make the news for handing out flyers and leafletsnationwide, the group is a shadow of its former self. Now splintered into around 70 different and loosely related groups, the KKK is estimated to have between 5,000 and 8,000 members. During its heyday in the early 1920s, the organization had between three and six million members and counted Governors, Congressmen and policemen among its ranks.